Many years ago, near the end of a very long Minnesota winter, a couple of my grad school friends came over for a summer beach party. I think you'd need to experience how long a Minnesota winter is to fully appreciate that we weren't crazy to do this. We needed a break from snow and down coats, even if it was for just one night. We turned up the thermostat, wore shorts and short sleeves, put floor plants on the table, (for more of a tropical feel, of course) ate summer food and watched South Pacific. I've always known how to have a crazy, rockin' time. A few weekends ago, I had almost the opposite party for myself. It has been such a mild winter that when I saw that it was supposed to actually snow one weekend, I got excited. I hoped against hope that it would be a big storm, that my husband and I would be snowed in, and that I'd bake and we'd watch movies the whole weekend. The snow came - and then left. It snowed a measly few inches and melted in less than 24 hours. Rather than give up my dream of baking and watching movies, I ignored the bright sun outside, turned on my oven and a few great 90s classics and had my own little "snow day". Sometimes you just have to be able to pretend in life. This banana bread came in the midst of my baking "snow day." It started more out of necessity, as so many banana recipes do, because I had some overripe bananas needing a project. Since there were many more involved projects going on in the kitchen that day, I decided to keep it simple and make some banana bread. This recipe fit the bill perfectly. 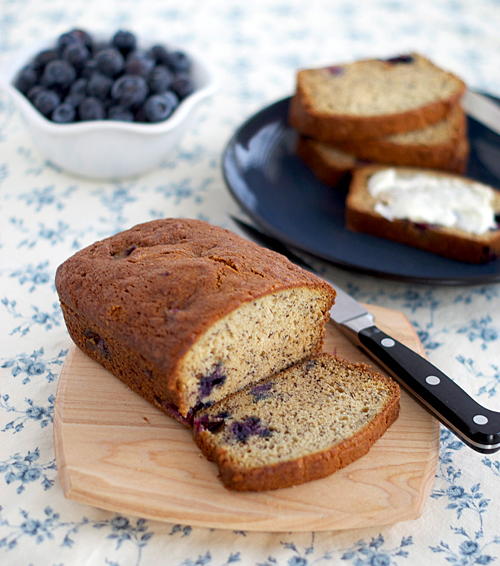 It's a quick recipe that makes a delicious, moist loaf of banana bread with great banana flavor. 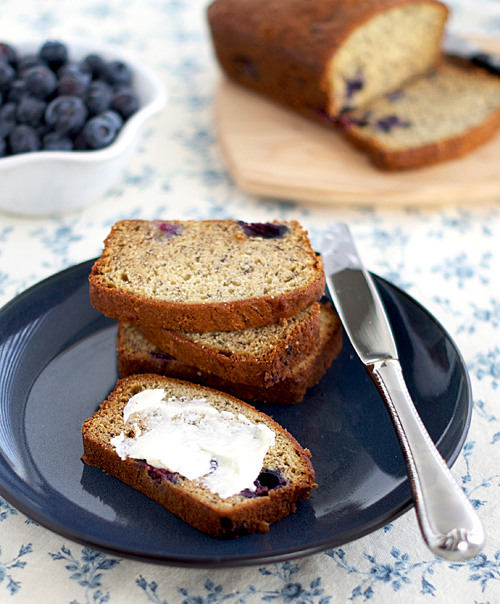 The addition of blueberries add nice bursts of flavor and color throughout the loaf. If you have a snow day coming up soon, whether real or pretend, I highly recommend baking this and curling up with a big, warm slice while watching your favorite old movie. In a bowl, combine the flour, baking soda and salt. In a large mixing bowl, cream the shortening and sugar. Add eggs and vanilla; mix well. Beat in bananas. Gradually add the dry ingredients, beating just until combined. Fold in blueberries. Pour into three greased 5-3/4-in. x 3-in. x 2-in. loaf pans, or 2 9x5 loaf pans. Bake at 350 degrees F for 30-35 minutes (small pans) or 40-45 min (larger pans) or until a toothpick inserted near the center comes out clean. Cool for 10 minutes before removing from pans to wire racks. What a beautiful bread for a slow, cold day. This looks so delicious Nicole. Just my type of chilly weather treat! Thanks for sharing. Have a great weekend! Okay - I was JUST looking at the ripe banana on the counter yesterday & thinking to myself, "self - those would be great in bread with blueberries" WOW - how did you know what I was thinking? Mmmm. I adore banana bread. Never had it with blueberries! I am SO making this soon! I hear you on the mild winter. I was wishing for snow too, but maybe back in January or February - now that we're into March, I'm ready for spring :) I'm intrigued by the bananas and blueberry combo, not sure I've ever tried it! Haha, the idea of a summer party during the winter is great! I never think to add additions to banana bread...but i love the fruit combo. I know what you mean about wanting a snow day. This mild winter has been disappointing, but it finally snowed a few weeks ago on my birthday which was just about best present I could ever get. I have a bag of frozen blueberries that I've been looking for something to do with. Adding them to banana bread sounds like a great idea! What a great combination blueberry and banana. Looks just delicious. This does look cozy. I love your pictures too. Love the blue streaks in between the slices...Yummy! A must try!